It's not every day that a former United States poet laureate comes to Santa Maria. But that will soon be the case. Juan Felipe Herrera, the 21st U.S poet laureate, is part of the community's celebration throughout April, which is National Poetry Month. Juan Felipe Herrera was the first Mexican-American to be named United States poet laureate. He held the position from 2015 to 2017, presenting poems and speaking all over the country. Herrera is visiting Santa Maria April 12 as part of Allan Hancock College’s celebration of National Poetry Month. Herrera will lead a workshop for 50 students at Allan Hancock College's Santa Maria Campus on April 12. That evening, Herrera will give a public presentation at Santa Maria High School's Ethel Pope Auditorium. Herrera said that while he has some ideas about what he will read and talk about, he likes to feel the room out before he reads and then decide what to share. "I'm going to read some poetry, that's for sure," he said. "Perhaps we might do some singing and do some poetry together." His laid-back and gentle nature doesn't immediately reveal the massive weight of genius underneath. Herrera is one of the country's most renowned poets; he served as poet laureate from 2015 to 2017 and was the first Mexican-American to be appointed to the position. His body of work is a long and beautiful testament to how a poet can transform difficult concepts and ideas into a lyrical symphony of language. The poet grew up as part of a family of migrant workers in the San Joaquin Valley, which had a strong influence on much of his later work. "We were a small family," Herrera said. "We traveled in an interesting shaped Army truck ... I think my father bought it at Fort Bliss in El Paso." His mother was the source of his introduction to poetry. He said she used to sing and recite rhymes she learned in an orphanage where she spent part of her youth. "Times were so difficult during the Mexican Revolution," Herrera said of this mother's childhood. "There was an option in Mexico City where you could just drop off your child at an orphanage ... that's what happened to my mother." 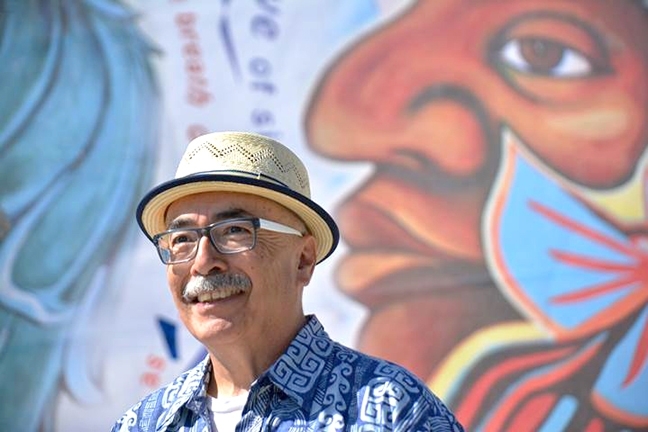 Juan Felipe Herrera, former U.S. poet laureate, will hold a lecture and reading at Santa Maria High School’s Ethel Pope Auditorium on April 12 from 7 to 8:30 p.m. The lecture is free and open to the public. The auditorium is located at 901 S. Broadway, Santa Maria. As an only child, Herrera explained, he got much of her attention in the form of songs, rhymes, and riddles. He said growing up with her songs, such as ballads from the Mexican Revolution, was like living in an array of verbal art. By the time he was in school, he said, his head was full of language and music. "I think that's the major root of my love of words and writing," he said. "By the time I hit seventh grade, I found I was fearful of being called on in the class ... . I spoke Spanish, and it was difficult to face an English-only classroom." It was then that Herrera decided to break out of the box he found himself in, he said. So he joined the choir to challenge himself to get on stage and face an audience, to see if it would help him speak up. The challenge worked, and little by little, Herrera came out of his shell. "I got a little more comfortable with speaking out," Herrera said. "With letting my voice come from my body and facing a lot of people on the stage. It was a slow process, but I had to do it." He earned a scholarship to UCLA, studying social anthropology and later earning a master's in the same field from Stanford University. From there, Herrera set off for the University of Iowa, where he earned an MFA in creative writing. In 1997, his book Calling the Doves won the Ezra Jack Keats Book Award. He has since published almost two dozen collections of poetry and other books. In 2008, he won the National Book Critics Circle Award for Poetry for his book Half the World in Light. In 2012, he was appointed California Poet Laureate. His book, 187 Reasons Mexicanos Can't Cross the Border: Undocuments 1971-2007, explores identity on the U.S.-Mexico border. It's written in Spanish and English and delves into issues of cultural hybridity. He said he was influenced in his younger years by the farmworkers' rights activists Cesar Chavez and Dolores Huerta, which led him to bring those topics to his writing. "I wanted to talk about this," Herrera said. "I agreed, they need to have a better life. Like my parents, they would have gained so much, and I would have gained much if they had a better life when I was a kid." In his Santa Maria lecture, Herrera said he wants to address the issue of being a united people during a historically contentious time. Herrera said he hopes to speak to students about the role they can choose to play in being the new generation, as speakers and voices for their community. "The overarching issue is going to be unity," he said. "As opposed to the partisan world we live in all of a sudden. I want to point to unity and I want to point to acceptance of everyone." Arts and Lifestyle Writer Rebecca Rose is quiet today. Contact her at rrose@santamariasun.com.